A new phenomena has been invented which benefits expecting couples nationwide: The Babymoon. Essentially it is the last chance for soon-to-be parents to enjoy some relaxation and alone time before their world is turned upside down. I’m sure this type of final vacation has always existed but only recently has the name Babymoon been coined (and urban dictionary has some pretty hilarious definitions if you need a laugh). As people who love to travel, we were all over it. 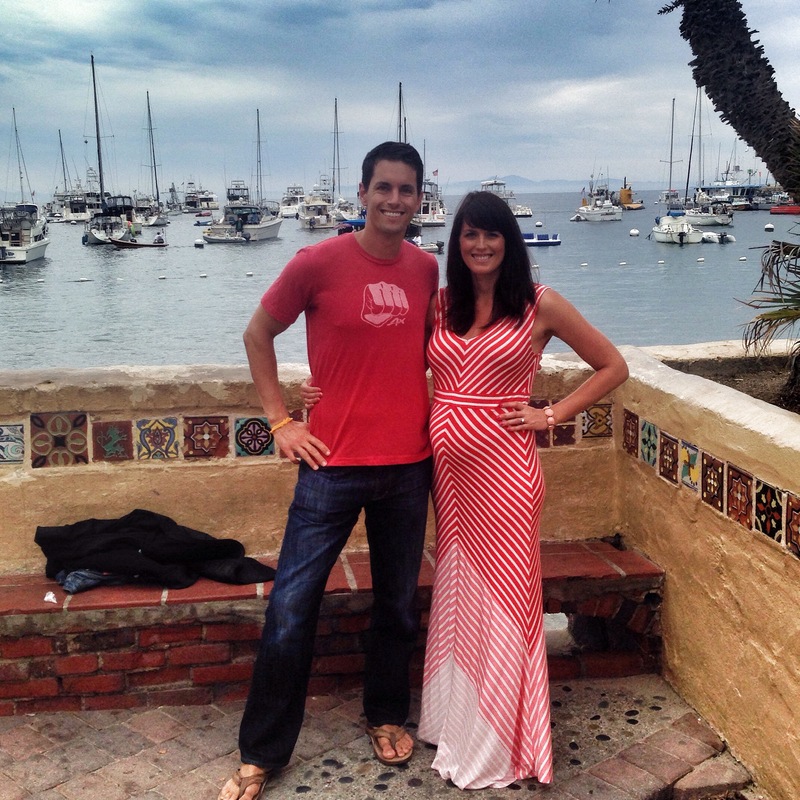 Since we just took what we called our “last hurrah” vacation to New Zealand last December and depleted our PTO accounts at work and our vacation budget, we planned a short, but wonderful getaway to Catalina Island. 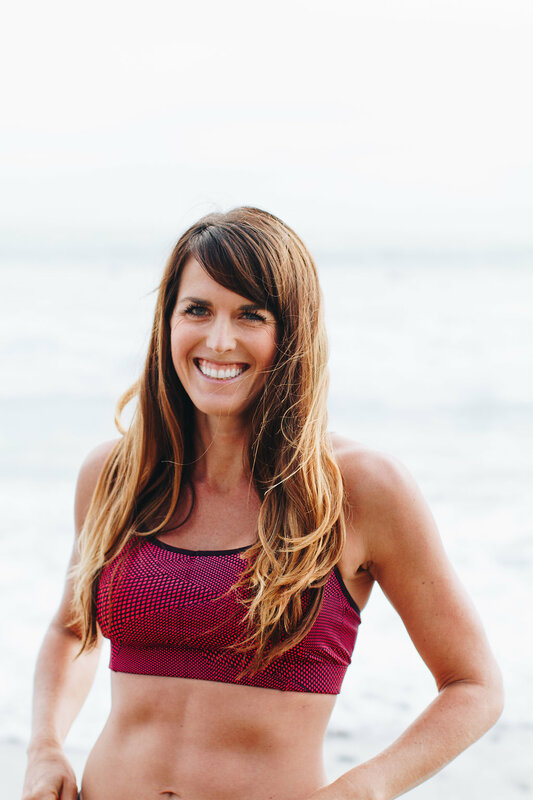 Catalina Island is just a 90 minute ferry ride from Orange County, and Orange County is just a 40 minute drive away from our house in Encinitas. Despite the close proximity, we felt like we were in another country when we arrived in the tiny town of Avalon on the beautiful island of Catalina. We took Friday off work and took the first ferry over, arriving just after 9 a.m. We spent the morning exploring the town on foot until our 12 PM tour began. 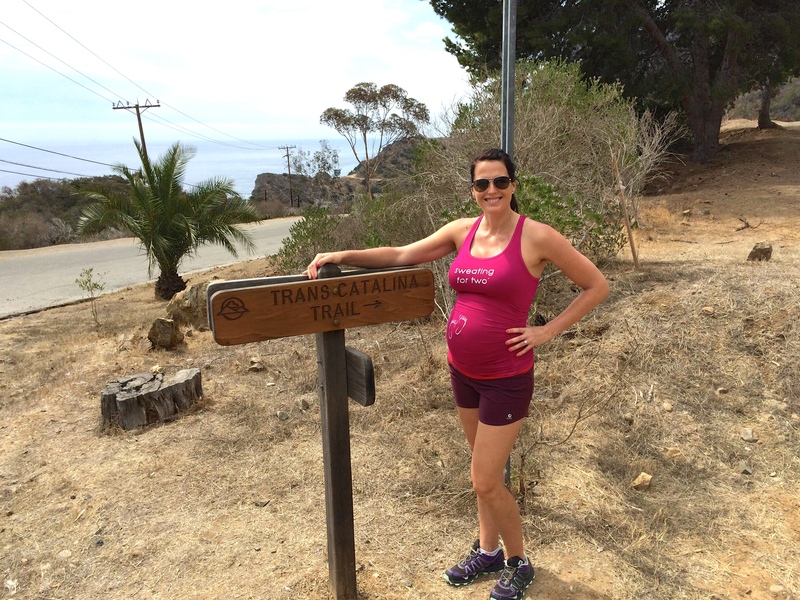 When researching what to do in Catalina, I came across what can only be the stereotypical pregnant woman’s fantasy – a 3 hour food tour! The tour promised that we’d get to sip, taste and savor our way through 6 different restaurants in town while also learning about the history of Catalina Island. The tour was just delicious and interesting as we imagined ( and randomly we even met another couple on the tour who shares our exact same wedding anniversary). As soon as the tour was over we checked into our hotel (the Aurora Hotel & Spa – I highly recommend!) and did the thing that I wish I could do EVERY Friday afternoon – took a 3 hour nap (get your mind out of the gutter!). I’m sure come September such laziness will be completely unheard of. That evening we had a great dinner at a seafood restaurant on the water, took another walk around town, and shared an ice cream. 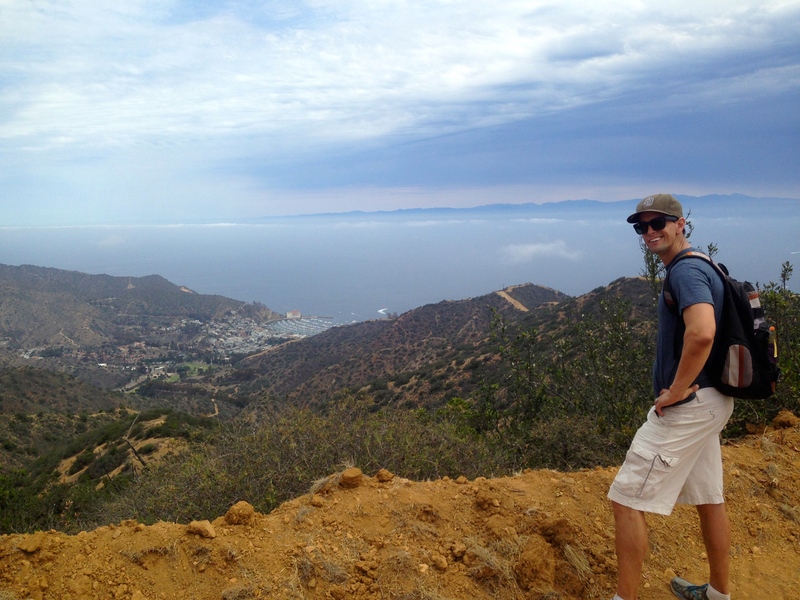 Saturday morning we headed over the Catalina Conservancy Center to ask about hiking in the area. 88% of the island is protected by a land trust, which includes over 62 miles of unspoiled beaches (the longest publicly accessible stretch of undeveloped coastline in Southern California) and a massive circuit of biking and hiking trails (there is a 50 miler, 2 marathons/half marathons and triathlon on the island each year). I knew that a lot of the trails would require transport to access, so we asked the woman at the Conservancy Center which hikes were accessible from Avalon. She suggested either a 7 mile or 10 mile trail and we decided to go for the 7 miler, although originally we were thinking that we’d probably only hike for 1.5-2 hours max. We had water and food and the entire morning free, so we figured we’d go for the 7 mile hike to get a real taste of what Catalina trails have to offer. The trailhead! Not knowing what we were getting ourselves into. It took about a mile of walking straight up hill on a paved road for us to reach the trailhead. Once we got on the trail, we literally hiked 5 miles straight up into the sky. We couldn’t really tell how tall the mountain we were climbing was because every time we’d come around a corner we’d be confident that the summit was just around the bend! Luckily I was feeling really good and was able to keep a good pace and didn’t even feel like I needed to take a lot of breaks. We only saw one other set of hikers, one set of mountain bikers and a off-road vehicle full of tourists during this entire section of the hike (which was 6 miles in total we later learned).I was thankful that the trail was desolate because I had to stop and pee twice and there were definitely no trees or large bushes to take cover behind! The trail was a wide, dirt road that was completely exposed so we were thankful that the clouds were hiding a lot of the sun and that we had remembered to put on sunscreen! I’m not sure what the woman at the conservancy office was thinking sending a 6 month pregnant woman off to do this incredibly tough hike but luckily I was up for the challenge! One thought kept crossing my mind while out on the hike – my massage! I had a 2 p.m. massage booked at our hotel spa and we made it back to the hotel just in time for a quick shower before it ( we stopped along the way home for tacos). The massage was one of the most relaxing and enjoyable massages I’ve ever had. The masseuse was incredibly attentive and crafted the massage just to my needs (I lay on my back and both sides only and it was still great). I was so incredibly relaxed afterward! That evening we got dressed up and headed into town for a romantic dinner at a nearby Italian restaurant, took a short walk and then headed to the Casino building (which houses a gorgeous theater and a ballroom, but no gambling!) to catch the nightly screening of Jurassic World. We had heard that going to the movies is a luxury once kids are in the picture (we rarely see movies anyway), so this seemed like a good baby moon activity. Also, not being able to drink takes some of the nightlife activities out of the picture so a movie was a good alternative. On Sunday morning we drank our coffee on a public bench near the water, people watching as we chatted. 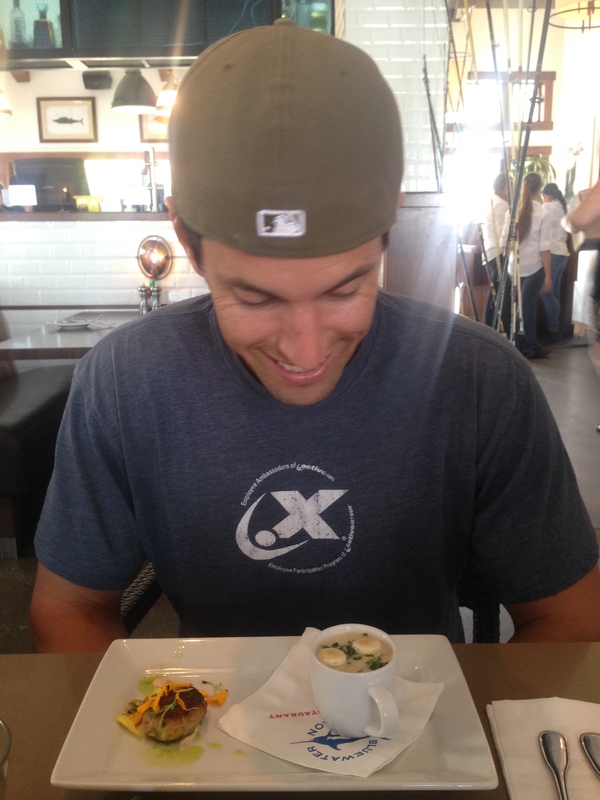 We took a walk and then grabbed a yummy fish taco lunch at the seafood restaurant on the water. And of course, we couldn’t leave the island without stopping for gelato before catching our 2 p.m. ferry back to the mainland. The weekend was really amazing. I keep saying that I felt the best I’ve felt during the entire pregnancy this weekend. We had such an incredible time and I was truly relaxed and happy. I keep dreaming of going back! 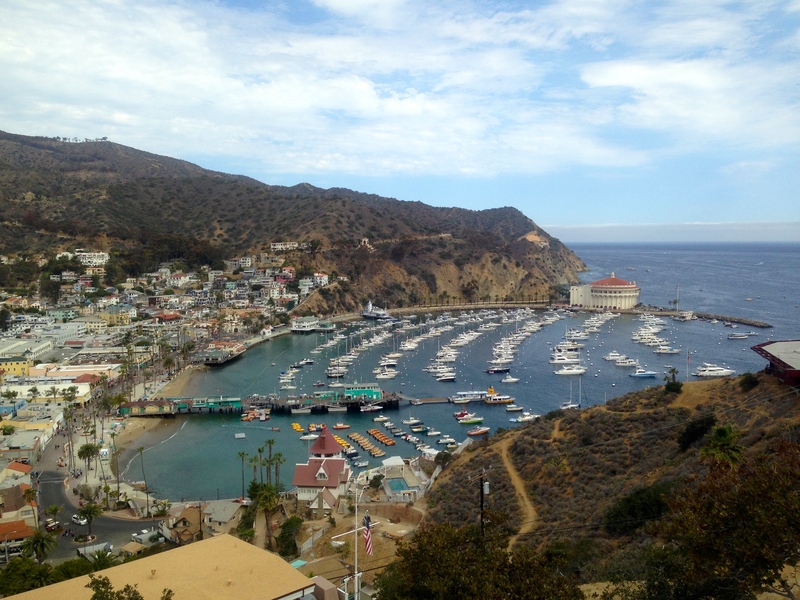 Have you ever been to Catalina? What other activities would you recommend that we get in before the baby comes? That is great to hear that you are feeling the best you have felt during pregnancy. A babymoon can definitely have that effect. You look great (I LOVE that red and white dress). Way to rock the hike. Do you ever feel any lingering pain or fatigue after putting in some good mileage or time on your feet? You sound like me having to stop and pee multiple times along your hike. I now pack a small roll of TP every time we head out on the trails. You just never know! Haha. 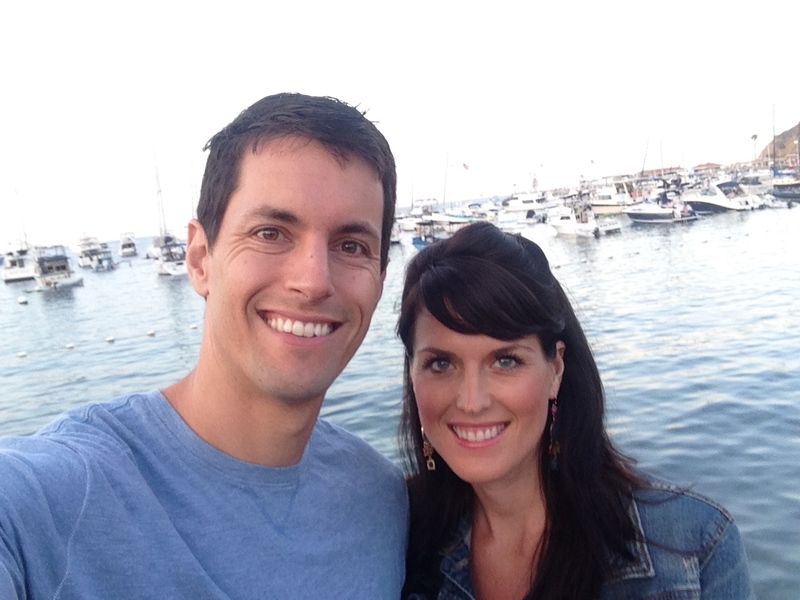 One of my girlfriends flew down to Catalina in April for a girl’s weekend. She said it was beautiful and a romantic place for couples. I’d like to see it someday. I was definitely more tired and hungry than usual in the day following the hike and had some soreness in my low belly- I think standing upright and supporting the belly for that many hours is hard work ! Sounds like a wonderful babymoon! I actually had not heard that term until now but it’s cute 🙂 That hike sounds pretty difficult to me and I’m not even carrying baby weight. Glad to hear the pregnancy is going well and you look so cute in your maxi dress. Thanks Sun!!! Hope you’re doing well! We’re already nearing our 1 year Bird Camp anniversary – crazy! It sounds like you had fun on your babymoon. 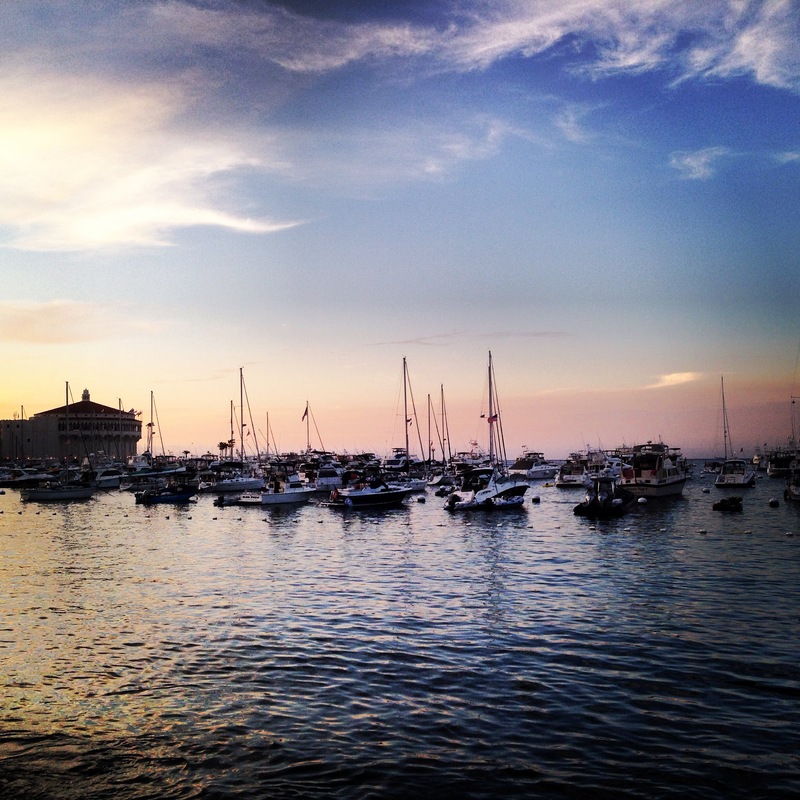 I love the sunset photo from Catalina Island–it’s gorgeous! 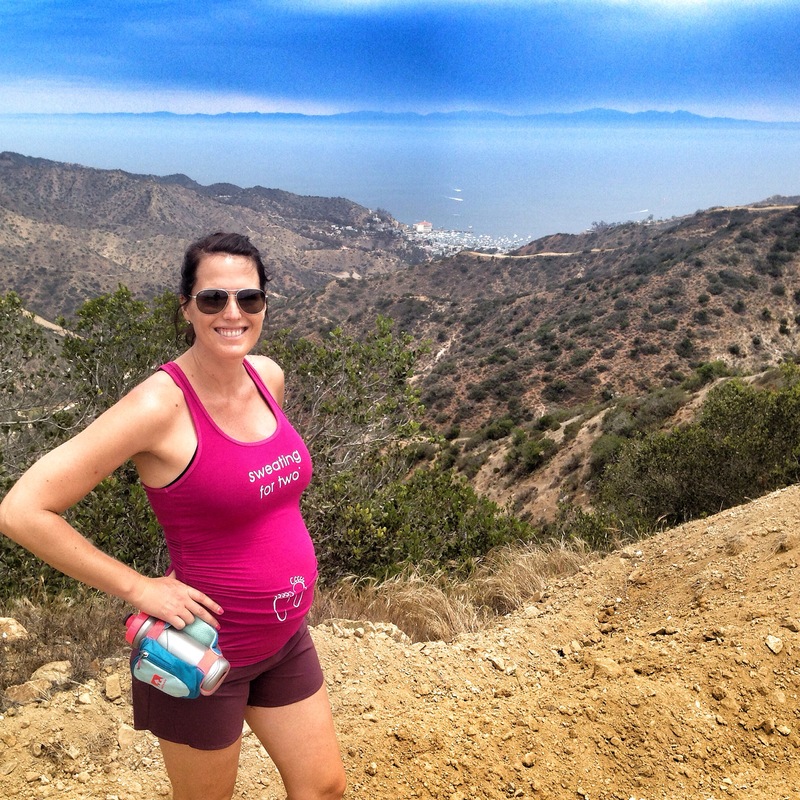 Good on you for staying active while pregnant. Great baby moon!! I went to Catalina when I was younger. I remember it being really pretty!